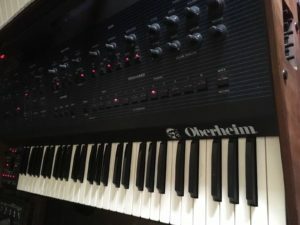 “This is the legendary Oberheim OB8 in pristine working condition. Cosmetically there are light signs of wear (all detailed in pics), most significantly a scratch on the upper right of the top casing, light scratches on the sides and back and some scuffing by the arpeggiator. Great condition for how old this keyboard is. 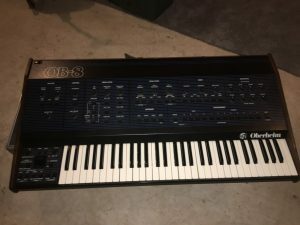 “This sale is for a vintage Oberheim Ob8 8 voice polyphonic analog synthesizer with factory midi. It’s in excellent cosmetic and working condition. It’s been cared for lovingly in a smoke free studio. This particular OB8 was previously owned by Earth Wind and Fire, one of several they owned. After Maurice White passed, one of their techs was tasked with selling their extra gear; this was part of that sale. 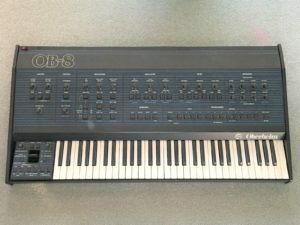 “DESCRIPTION : This listing is for a Oberheim OB-8 Analog 61 Note Keyboard Synthesizer. This machine just came to us from Rosen Sound here in Burbank. It has been fully serviced, cleaned and prepared for flawless operation for years to come. ACCESSORIES : Includes a power cord. Otherwise, this item comes only as seen on photos. PHYSICAL CONDITION : Very Good. The wood side panels were just re-finished by Rosen Sound here in Burbank. So they are immaculate. This unit has light scratches and a bit of wear on the metal exterior, but all the text around for the parameters and the visual touches are in great shape. Sturdy and in fine condition overall! “THIS IS A OBERHEIM OB-8 WITH FACTORY MIDI ANALOG SYNTHESIZER! ( not the case if you transmit the notes via midi ). I’m sure some cleaning would fix this, all in all the synth performs great with these hiccups and I’ve written many songs with it in this state. 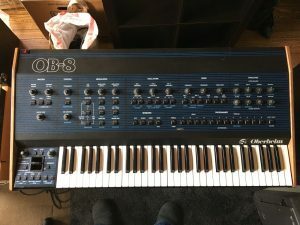 ” Oberheim OB8 with factory midi in excellent functional and cosmetic condition.The OB 8 comes with a travel case and original OB8 operating manual and patch cassette. This unit has been modified in 3 ways. 1) The original problematic Panasonic keyboard has been replaced with a new custom Fatar keyboard. This keyboard has a built in aftertouch sensor and was installed by Retrolinear. 2) A sophisticated AT circuit was installed by New England Analog and includes a Pyxis controller and external pressure pad controller. Check out YouTube videos by New England Analog and the Pyxis control system.The Pyxis controller allows the AT to control the VCO, VCF, VCA, and LFO by intensity and speed. A series of toggle switches on the back of the synth allow a variety of AT combinations such as pitch bending up, down, or Osc 1 up and Osc 2 down. Do a search on NEA’s Pyxis controller and its capabilities and 3) bass boost which was done by replacing the 100k R505 and R506 resistors with 1M resistors(4) and building a network of 4x of 120K resistors and 0.0056 film caps in series and connecting the small network in parallel to the new 1M resistors.This modification helps create a better low end somewhere in between a standard OBX-A and an OB 8. Replaced calibration summing TL 071 Op amp and the two TL 072 output OP amps. all 16 oscillators tuned and calibrated. 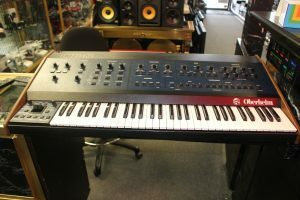 “This auction features the mighty Oberheim OB-8 synthesizer. It’s in excellent cosmetic and working condition and sounds incredible without any issues whatsoever. I am the second owner of this unit and it has never left my home studio. It was recently professionally serviced in late 2013 (see invoice pic above) which included a replacement battery, full recalibration, and two mods. The first modification was a bass boost which makes the synth sound even more ballsy. The second was to increase resonance by about 20% on the filters. Both of these mods have the net effect of making this OB-8 sound closer in tone and attitude to the OB-Xa. I had a friend’s OB-Xa over to compare and they sound nearly identical with these mods on this OB-8. Of course, these mods are fully reversible and I’ll include all the documentation regarding what was done in case you want to reverse these mods to make it back to fully original. 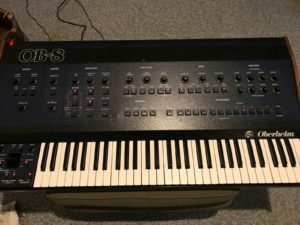 If you’re looking for an OB-Xa but don’t want all the hassle of maintaining one, I highly recommend you check this OB-8 out! I’m not 100% certain, but it’s rumored that Justin Bieber does not own an OB-8…so if you win this auction, you’ve got that going for you. Included in the auction is the fully-serviced Oberheim OB-8 (modded to sound closer to the OB-Xa), original user manual, invoice from maintenance, documentation on mods, and power cord. This unit will be packed professionally. Please review my feedback record (100%!!!) and bid with confidence. “In good, fully working order, recently serviced and calibrated. Cosmetically its not bad – has some light scratches and signs of wear and tear in keeping with a synth of this age. 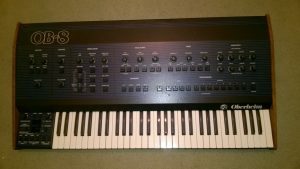 It does have one shallow particular dent between the buttons on the modulation section, and in the interests of an honest sale, if your after a spotless example / museum piece, this OB8 might not be the one for you. I bought this one new directly from the Oberheim in 1983. I used it for songwriting, and as a general inspiration tool. I used my new OB-8 nearly every day, writing songs for the film. So… It is upon this exact OB-8 Synthesizer the first whisps and golden threads of “Don’t You Forget About Me” slipped from the speakers, and into our ears to be nailed down for the record. There’s to the pedigree… Now as to it’s condition. The synth has been well cared for, and is in perfect working order. Plug it in, and it’s good to go. All original factory presets intact. It has never been on tour or banged about on stage. It is clean, and has given very good service. given to me by A&M Records at the time. For your consideration is an Oberheim OB-8 analog polyphonic synthesizer. The synth has been used in our smoke free studio, and shows some minor cosmetic wear(see pics). The OB-8 has been completely tested, serviced, and is fully functional. The OB-8 has had a routine servicing which included replacing the old capacitors in the power supply and cleaning the keyboard contacts. “The Oberheim OB 8 is one of the crown jewels of the synth world. It’s a beautiful sounding synth and if you want your music to really stand apart sonically then you’re in the right place. But you know that already. It’s in immaculate condition. There are no dents, dings or scratches and it works perfectly looks are show room spec a real classic and collectors dream machine the pictures alone do not do it justice. It has had the keybed cleaned and replaced a couple of years ago and It comes with the Encore midi kit installed as well to sweetin the deal I am throwing in the MRAM ram upgrade a spare VCO, EG and VCF CEM chips which is still brand new in the seal please see the picture. 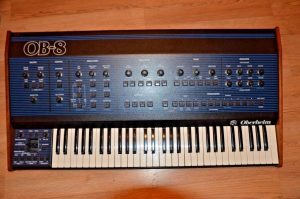 “Beautiful condition near mint OB8 in perfect working order with MIDI. Was owned by a synth tech before me so has been well maintained and looked after.